Sarajevo is the largest city and capital of Bosnia and Herzegovina. It has a historic reputation as a city of religious diversity, with Islam, Catholicism and Orthodoxy all well represented throughout the centuries. Although the area of Sarajevo has been inhabited since prehistoric times, it wasn't until it was conquered by the Ottomans that it gained prominence. It was under Ottoman rule that the Old Town (Stari Grad) was constructed. The city was burned to the ground by the Habsburg Monarchy in 1697 and never fully recovered. It remained an important administrative center for the Ottoman Empire until the late 19th century when the Austria-Hungarian Empire conquered Bosnia and Herzegovina. On June 28, 1914, Archduke Franz Ferdinand of Austria and his wife Sophie, Duchess of Hohenberg, were assassinated in Sarajevo - an event that triggered World War I. Following the war, the Balkans were unified under the Kingdom of Yugoslavia. In 1984, at the peak of a boom period for the city, Sarajevo hosted the Winter Olympics. As Yugoslavia was disintegrating in 1992, Sarejevo was surrounded by the Yugoslav National Army and several paramilitary formations. The city remained under siege until October 1995, with drastic consequences for the population and considerable destruction. After the Dayton Agreement was signed in 1995, the city underwent a great deal of reconstruction, with very little evidence of the war remaining. Sarajevo is now a cosmopolitan city that delights its visitors with a friendly attitude. Bjelašnica Mountain is in the central part of the country and is directly southwest of Sarajevo. During the summer this mountain is a popular place to go hiking while in the winter it is a popular downhill skiing mountain. The Bjelašnica Ski Area has several nice runs and a large area above the tree line, which is ideal for fans of bald peak skiing. The mountain is 2,067 metres (6,782 feet) high and is a day trip from Sarajevo. There is a accommodation on the mountain for people thinking of spending the night. The Latin Bridge is where the assassination of Archduke Franz Ferdinand of Austria took place. This festival began in 1984 and has since grown to become one of the most anticipated events in Bosnia and Herzegovina. Often held in the month of February, art exhibits from different parts of the world compete for the highest title possible, the Sestoaprilska Negarda Sarajeva. One of the most popular cultural events in Sarajevo, the month-long festival of Bascarsija Nights features some 40 to 50 different events that honor the rich culture of Bosnia. It is marked by different children’s programs, literary events, film showings, classical music, and even opera and ballet. The Sarajevo Fim festival is held annually in August. Long and short regional films from a wide variety of genres are shown (some for free). It also serves as a huge venue for artists from all over the world to meet and share their passion for the arts. Held in November, Jazzfest Sarajevo is the best place to enjoy Bosnia and Herzegovina’s rich music scene. The city’s café culture is at its liveliest. 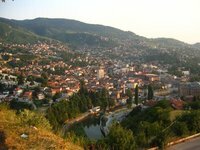 Sarajevo has a continental climate with warm summers and cold winters. Temperatures in summer are well above 25 °C during the day, while winter nights can drop below -10 °C. Rain (and snow in winter) falls evenly throughout the year. June and September are good months, avoiding cold or hot weather and crowds as well. Sarajevo International Airport (SJJ) is located a few kilometres to the southwest of the city. There are good connections within Europe offered by B&H Airlines to Amsterdam, Belgrade, Copenhagen, Frankfurt, Gothenburg, Istanbul, Stockholm, Vienna and Zürich, Austrian Airlines to Viena, Adria Airways to Ljubljana, Croatia Airlines to Zagreb, Germanwings to Cologne/Bonn, JAT Airways to Belgrade, Lufthansa to Munich, Malév Hungarian Airlines to Budapest, andTurkish Airlines to Istanbul. There are also seasonal flights to Antalya, Bodrum, Hurghada, Sharm el-Sheikh, Monastir, Jeddah, Medina (latter two both during Hajj). Waiting time: 10 KM per hour. The rate is increased by 30% during the night (10:00pm - 05:00am) and on Sundays and holidays. An option to save some money is to catch a taxi to the nearby tram terminus at Ilidza and then catch a tram from there into the city. Trains travel between Sarajevo and Mostar and continue to Ploce along the Croatian coast. There are also trains travelling to Zagreb and Banja Luka among smaller places. There are buses between Sarajevo and numerous places, including Mostar and Banja Luka, and also to international destinations like Zagreb, Belgrade and many central and western European cities. GRAS operates public transportation in Sarajevo. The centre of Sarajevo is served by a spinal tram network which makes a counter clockwise loop around the central district. This tram network opened in the mid-1870s and was the first in the Austro-Hungarian Empire. Tickets should be purchased in advance from kiosks labeled tisak on the street or from the driver, where they cost slightly more (around 1.80KM). Tickets should be validated upon boarding the vehicle and are valid for a one way trip only. Changing tram or bus means validating a new ticket. A day card valid for unlimited travel on all local public transport in Zone A is available for about 5KM. Please note that inspectors board public transport very frequently: if you can't reach the validator machine because the tram is too crowded, then don't board the tram. Most of central Sarajevo, including the old town area can easily be navigated on foot. It is about 15 minutes from the central train and bus stations to the old town. Most cities and major towns have at least one internet café. Wifi is becoming more and more popular as well, especially in cities like Sarajevo and Mostar. Don't rely on it though, as outside the main tourist areas, there might be few options. There are three mobile phone networks in Bosnia and Herzegovina: HT ERONET (Mostar), GSMBiH (Sarajevo) and m:tel (Republika Srpska, Banja Luka). You can buy a prepaid SIM card from any network at any kiosk for 10 KM or less. Be careful with roaming charges on your smartphone, as mobile internet when abroad is still extremely expensive. BH Posta offers postal services in Bosnia and Herzegovina. Prices and services are very reasonable and reliable. Post offices are generally open from 8:00am to 4:00 or 5:00pm during weekdays and also on Saturday mornings. The main post offices in big cities like Sarajevo might keep longer hours. For sending packages you might consider a private courier like FedEx, TNT, UPS or DHL. This is version 31. Last edited at 3:09 on Aug 2, 17 by sleepBot. 22 articles link to this page.